Emergency Broadcast Communications: Emergency Communications - 911Broadcast Emergency Notification Articles for Emergency Alerts and Community Warnings. This section of our technical library presents information and documentation relating to Emergency Notification Systems and Disaster Recovery Applications. If an emergency arise in your community, our 911 broadcast service can deliver large volumes of calls quickly using thousands of phone lines simultaneously. Should a snow storm, wild fire or flood hit your area, we can alert your community quickly providing specific instructions if an evacuation is required. This service is available using our emergency broadcasting systems. If a dangerous chemical spill occurs in your community, you can target specific areas to call. If a severe snow storm hits your area, your community can be notified of school closings or event cancellations. The following article relates to Emergency Notification Systems and other similar or related topics. During emergencies - local, state, and national - the importance of our country's telecommunications and broadcast systems becomes clear. We use our phones to call 911 or to call our family members to make sure they are safe; we turn on our televisions and radios to get information updates. While there is no doubt that our country has one of the world's most extensive and dependable telecommunications and broadcast systems, unusual conditions can put a strain on them. The following information will help you better understand what happens within the telecommunications and broadcast systems during an emergency and how best to use these systems during a crisis or disaster. the Emergency Alert System; and radio and/or broadcast or cable television station news and updates. The 911 network is a vital part of our nation's emergency response and disaster preparedness system. Upgrades in this network to provide emergency help more quickly and effectively are constantly being made. For example, most wireline 911 systems now automatically report to the PSAP the telephone number and location of calls, a capability called "Enhanced 911" or "E911." By receiving the telephone number of the caller, the PSAP is able to call back in the event the call gets disconnected. The PSAP is also able to determine the location of the caller by cross-referencing the telephone number against a location database. Wireline E911 is available in most parts of the country. While wireless phones can be an important public safety tool, they also create unique challenges for public safety personnel. Since wireless phones are by their very nature mobile, they are not associated with one fixed location or address. In an effort to increase the ability of emergency personnel to respond to wireless 911 calls, the Federal Communications Commission (FCC) has adopted rules requiring wireless telephone carriers to provide E911. If your wireless phone is not "initialized" (i.e., you do not have a contract for service with a wireless service provider), and your emergency call gets disconnected, you must call the emergency operator back because he or she does not have your telephone number and cannot contact you. To help public safety personnel allocate emergency resources, learn and use the designated number in your state for highway accidents or other non-life-threatening incidents. Often, states reserve specific numbers for these types of incidents. For example, "#77" is the number used for highway accidents in Virginia. The number to call for non-life-threatening incidents in your state can be found in the front of your phone book. At the present time, wireline phones and analog wireless phones can transmit 911 calls to PSAPs from callers using text telephone devices (TTYs). The FCC encourages TTY users to call 911 directly for immediate service. However, if TTY users choose to contact a PSAP via Telecommunications Relay Service (TRS), TRS centers will need to forward the TTY caller's phone number to the PSAP, delaying transmission of this information to the PSAP. Wireless service providers have made technological changes to their networks to provide TTY compatibility for digital wireless calls for consumers with select TTY-compatible handsets. However, in certain locations TTY users may not be able to complete 911 calls successfully to 911 emergency call centers using these newly available digital wireless services. The Commission is encouraging public safety organizations, vendors of TTY equipment for 911 call centers, TTY vendors, and wireless service providers to work together both to better identify the extent of these difficulties and to develop solutions. In the meantime, TTY users should consider such alternatives for placing an emergency 911 call as landline phone service, analog wireless service, or TRS. At the PSAP, the operator verifies the caller's location, determines the nature of the emergency, and decides which emergency response teams should be notified. Sometimes a single primary PSAP will answer for an entire region. In most cases, the caller is then transferred to a secondary PSAP from which help will be sent. Secondary PSAPs are sometimes located at fire dispatch offices, municipal police headquarters, or ambulance dispatch centers. Communities that don't have PSAPs rely on public safety emergency operators and communications centers to process emergency calls. Once the call is processed, the PSAP operator or dispatch center alerts the appropriate emergency response team. During emergencies, radio systems frequently are used by emergency units and officers at the scene to coordinate activities among all emergency personnel - fire, rescue, police, dispatchers, etc. - with the emergency units on their way and with dispatchers at command bases. If the telecommunications network is damaged in a disaster, your wireline or wireless phone and text pager may not work. If only your electricity goes out (a "black-out"), your telephone may still work. In a black-out, you still may be able to use your wireline phone because electricity and telephone transmissions travel on different wires. If you keep the battery on your wireless phone and text pager fully charged, you should be able to use these, too, in a black-out. Text pagers have a built-in radio transmitter/receiver. Messages are transmitted over the wireless network, a nationwide network of radio towers that transmit data. Some text pagers can subscribe to the National Oceanic and Atmospheric Administration's (NOAA) National Weather Service for any weather alerts. When a telephone call is completed on the public telephone network, transmission circuits are assigned and dedicated between the two users for the length of the call. The telephone network is engineered so that during normal usage there are adequate facilities that can be assigned and dedicated to handle the number of calls during the peak period. However, if during a disaster or emergency the number of calls exceeds that peak (or if the network transmission capacity is reduced), then some calls will be blocked. And, of course, if the phone being called is already in use, the call will certainly be blocked. The Internet backbone uses shared rather than dedicated transmission facilities so that even during heavy usage the Internet will work, albeit perhaps more slowly. Cable modem and DSL users who have dedicated Internet access can generally get through to their e-mail systems, although dial-up Internet users may experience some blocking when they try to dial their Internet Service Provider (ISP), either because the local telephone system is congested or all the ISPs' lines are busy. E-mail itself is an Internet application which has the additional characteristic that the recipient doesn't have to be available at the same time as the sender, and instead can connect to his or her own mail system at his or her convenience to retrieve messages that have been delivered there. In the event of an emergency, many people stay tuned to local radio and/or television stations to receive updates on what is happening and what to do. 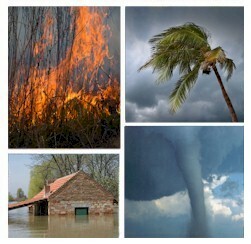 There is a nationwide broadcast system in place for national disaster or other large-scale disasters. The Emergency Alert System (EAS) provides not only the President, but national, state, and local authorities with the ability to give emergency information to the general public via broadcast, cable, and wireless cable systems. All broadcast stations and cable systems are required to broadcast emergency alerts and messages for national security emergencies initiated by the President. Broadcast stations and cable systems are not required to broadcast EAS alerts and messages initiated by state and local authorities, but the FCC encourages broadcast licensees and cable operators to transmit emergency alerts as a public service. Information about local natural disasters is often broadcast via EAS. All EAS broadcasts should be accessible by audio and visual means, or simple visual means, including closed-captioning, open-captioning, crawls or scrolls. Because broadcast stations and cable systems are not required to broadcast EAS alerts and messages initiated by state and local authorities, the FCC has separate requirements to meet the needs of persons with disabilities in cases of local emergencies. The FCC requires that any information that is intended to further the protection of life, health, safety, or property, such as immediate weather situations, civil disorders, evacuation orders, school closings, relief assistance, etc., be accessible to persons with disabilities. These rules apply to all local broadcasters, cable operators, and satellite television service providers. There are no exemptions to these rules and they apply any time emergency information is provided. Critical details about the emergency must be provided in a visual format, such as open captions, scrolls, or even hand-lettered signs. The critical details must also be provided in an aural format. If crawls or scrolls are provided during regular programming, an aural tone is required to indicate to persons who are blind or who have low vision that emergency information is being provided. The Federal Emergency Management Agency (FEMA) is responsible for responding to national disasters and for helping state and local governments and individuals prepare for emergencies. The Department of Homeland Security is responsible for preventing terrorist attacks within the United States, reducing America's vulnerability to terrorism, and is also responsible for minimizing the damage and handling recovery operations if attacks do occur. The Homeland Security Advisory System provides a way to distribute information regarding the risk of terrorist acts to federal, state, and local authorities and to the American people. The system provides warnings in the form of a set of graduated "Threat Conditions" that increase as the risk of the threat increases. State Civil Defense alerts the public of any changes to the threat level through the news media. In case of level red, the state sounds the emergency alert siren. At each threat condition, federal departments and agencies implement a corresponding set of "Protective Measures" to further reduce vulnerability or increase response capability during a period of heightened alert. Severe Condition (Red) - Severe risk of terrorist attacks. High Condition (Orange) - High risk of terrorist attacks. Elevated Condition (Yellow) - Significant risk of terrorist attacks. Guarded Condition (Blue) - General risk of terrorist attacks. Low Condition (Green) - Low risk of terrorist attacks. For additional information and/or advice on communicating during emergencies or what to do during a national or local emergency, visit FEMA's Website, www.fema.gov or the Department of Homeland Security, www.dhs.gov/. Always have a battery-operated radio with fresh batteries on hand. If you have cable, always have one television set that can receive over-the-air signals so that you can still receive a television signal if your cable system goes out. Always keep your cell phone battery charged. Assemble a first aid kit for your home and each vehicle.